Throughout the recession, media reports frequently spoke of Ireland’s suicide ‘epidemic’ as the number of people taking their own lives appeared to inexorably climb. Rising unemployment, collapsing investments and negative equity were all blamed for the increase, yet behind the stories; the rate of suicide was not changing in the way it was sometimes being portrayed. In fact, the rate of suicide in Ireland hit its peak in 2001 at 13.5 suicides per 100,000 people and by 2004 – a “Celtic Tiger” year in which economic growth was running at 4.6 per cent – the rate still remained at 12.2. That 2004 rate of 12.2 per 100,000 has never been exceeded since. The rates began to drop in 2005 and even though some of those gains were lost during the recession, making a clear cut link between the state of the economy and suicide is nowhere near as simple as people sometimes think. 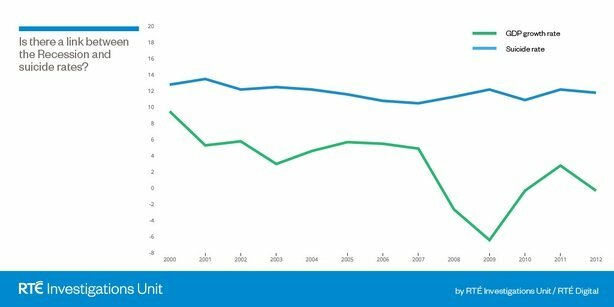 There is an equally compelling argument to be made that the problem of suicide in Ireland was at its worst in the period between 2000 and 2004, during the height of Ireland’s Celtic Tiger. So why the confusion and the widespread belief that this was a problem that was out of control in a nation brought economically to its knees? In part, it was a case of simple numbers. The number of people dying by suicide each year was rising and that figure reached a new high in 2009 when 552 people took their own lives. The total number however, is never the full story and Ireland’s population, all through the boom, had also risen dramatically. Between the census of 2002 and the census of 2011, the number of people living in the Republic grew by more than 650,000. While the actual number of suicides was climbing, this was exactly what would have been expected in such a rapidly growing population, just as the number of cases of, for instance, cancer would also rise proportionately. Underlying those headline figures and an apparently ever increasing problem, is the rate of suicide – which is measured per 100,000 population – and is a much more reliable indicator of the scale of a problem. When that rate is analysed, the assumption of a link between the recession and suicide becomes much less clear-cut. The figures were broken down according to geographic area, county and province, age, gender, employment status, and even the way in which the person died. It provides a comprehensive background to a very real and every day problem but nonetheless a problem about which society tends to make many assumptions, some supported by the evidence, some not so much. The number of suicides reported in Ireland has risen enormously over the decades from when just 76 deaths were recorded in 1950 to a peak of 554 in 2011. Those stark figures hide an enormous societal shift during which suicide itself was decriminalised in 1993 and some of the taboos and stigma surrounding it have been broken down. It is clear that suicide was under-reported in the past and even now, most experts believe that it goes under-counted. Fine Gael TD Dan Neville, the President of the Irish Association of Suicidology, said it would always be extremely difficult to determine exactly the numbers of suicide in any society. Mr Neville said recessionary factors can play a part in suicide rates but that there had been evidence elsewhere to suggest that in times of boom – the rate can even rise. Classification of suicide has always been a particular problem as trying to determine somebody’s intentions after they died can be very difficult in the absence of clear evidence. A small number of people who take their own lives will also actively try to disguise what they are doing. That makes the job of the Central Statistics Office in compiling these figures very difficult and the data could never be considered as being as reliable as something like ordinary births or deaths. The National Suicide Research Foundation carried out an analysis of trends over time and the impact of the economic recession and austerity on suicide and self-harm. Their analysis found there was a clear decreasing trend from 2001 to 2007 but since then self-harm rates and suicide rates had increased significantly. In a forthcoming paper, the foundation reports on a time-series analysis, which projected what might have happened had the rate of suicide continued to decrease beyond 2007. It found that the rate of male suicide by the end of 2012 was 57% higher than it might have been had the economic recession not happened and if the downward trajectory had continued. In absolute numbers, their analysis found that there were an additional 476 additional male suicides on top of what “would have been expected” as a result of the collapse of the Celtic Tiger. You can read more about their research here. Where a person lives appears to have an enormous impact on the rate of suicide, with two of Ireland’s largest cities recording extremely high rates. Limerick City recorded an average rate of suicide of 16.7 per 100,000 people over the fourteen years of figures that we examined while the rate in the rest of Limerick County was 12.2. 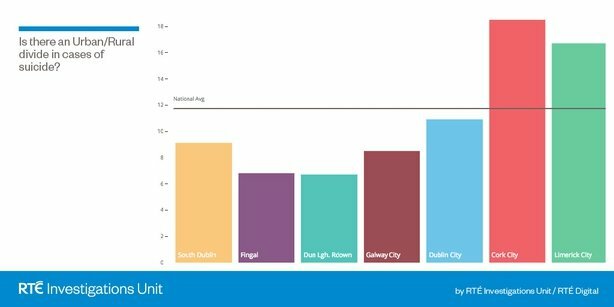 Cork City recorded the highest average rate at 18.5 per 100,000 and similarly the rate in the rest of Cork County was far lower – albeit still high – at 13.5. From 2000 to 2013, the national average was 11.8 per 100,000 although that figure may end up fractionally higher as figures for 2013 are provisional, and could still rise slightly. Rates of suicide in Offaly, Wexford, and North Tipperary were also well above average and if you wish, you can explore our interactive map here to see rates across different counties and across the years. The rate of suicide was remarkably low in some areas of the country with an average rate of just 6.7 per 100,000 recorded for the Dublin region of Dún Laoghaire-Rathdown over the fourteen years examined. Another Dublin region, Fingal, also has a low average rate of just 6.8 while the average rate in Galway City across the time period examined was 8.5. These figures appear to dispel any notion that either urban or rural areas are more likely to have a problem with suicide. That link is impossible to make when heavily urbanised areas are responsible for both the highest and lowest rates found, although underlying socio-economic factors may also be playing a big part. There are only small provincial variations from the national rate with both Connacht and the three counties of Ulster both exactly at the national average. Leinster is slightly below average, its figures brought lower by the high rate of population in Dublin, and the apparently low rate of suicide in parts of the capital. Similarly, Munster rises above the national average, at least in part because of the high rates in the cities of Cork and Limerick. One of the most common assumptions about suicide is that men are more likely to take their own lives than women and that idea is resoundingly supported by the data. Men are between four and five times more likely to die by suicide than women are. In 2013, the most recent year for which figures are available, the rate for men was five times higher though it is important to note that this does not necessarily indicate any particular trend for the future. The average rate of suicide among men was 19.1 deaths per 100,000 across the fourteen years examined, with the rate shifting constantly from year to year, with a low of 16.5 in 2007 and a high of 22.4 in 2001. The highest single figure found in the gender data was male suicide in Limerick City in 2000 when the rate climbed to 61 deaths per 100,000 of male population. Seemingly out of the ordinary figures like that are being looked for by both health authorities and the Central Statistics Office to try and identify the possibility of clustering. However, there is a difficulty with that method in that by the time reliable figures become available, it may already be too late to try and make a specific intervention. The average rate of suicide amongst women stood at 4.5 per 100,000 in the period between 2000 and 2013 and again that figure fluctuates significantly. The highest rate recorded was in 2003 with 5.5 suicides per 100,000 women with a rate of just 3.4 recorded in 2013. All figures from 2013 have to be treated with caution however, as they may end up being reviewed, and the next lowest rate for women was the 3.8 that was recorded in 2006. Huge variations also exist between different age groups and perhaps somewhat wrongly men in their late teens and early twenties are often identified as being most at risk. 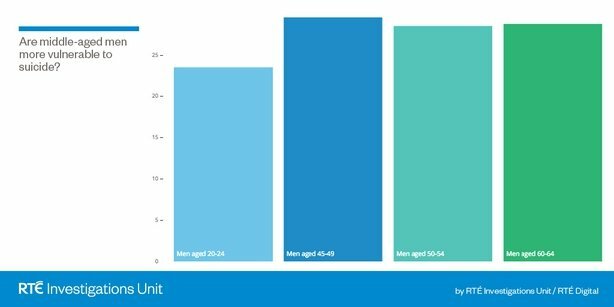 While rates are very high amongst men between the ages of 20 and 29, they are routinely exceeded by men in their middle age, particularly over recent years. In every year from 2010 to 2013, the highest rate of suicide was recorded among men in the age bracket of 45 to 49. For women, the rates are less reliable – in part because the numbers involved are so much smaller – but the higher rates tend to come later in life than for men. Rates of suicide among all older teenagers have tended to be either at or below the national average rates for the past five years. Suicide is extremely uncommon among those aged fourteen years or under but the statistics do show that 43 children from that age group took their own lives over the fourteen years of figures analysed. Data on the jobs or industries in which people work is incomplete and the Central Statistics Office is actively trying to improve the accuracy of the way those statistics are compiled. There are innumerable preconceptions about professions where suicide is supposed to be common but with the data currently available, it is not really possible to make any firm judgments. Deaths are recorded according to socio-economic groups like higher professional or skilled manual workers, which make it difficult to make comparisons as the categories are so broad. 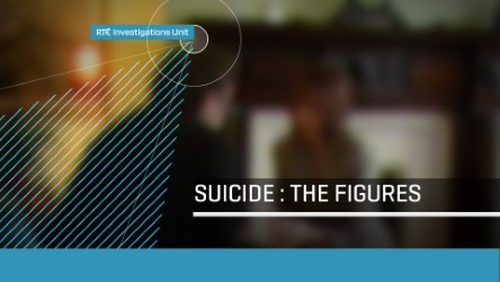 Large numbers of suicides – 205 of 541 in 2012 – are categorised as unknown, where occupation is not stated, which further rules out the possibility of close analysis. Where figures are available is when it comes to employment status. In 2013, 21.3% of suicides were among jobless people while the rate of unemployment fell from 13.7% in January to 12.1% in December (averaging out at 12.9% for the year). 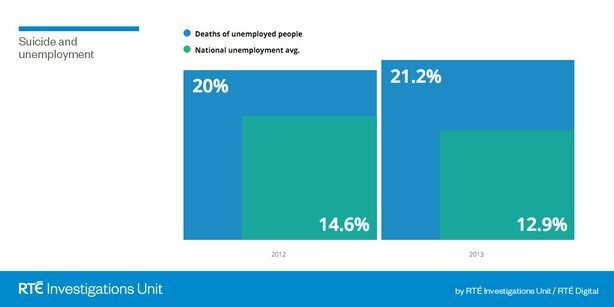 That link was less clear cut in 2012 however when 20.3% of suicides related to people who were unemployed and the jobless figure dropped from 15.1% to 14% by year end (average of 14.6%). Once again, there are difficulties in saying that having no job – or losing a job – plays a major role in determining the likelihood of suicide. There are as always other factors at play including mental illness, known to be a very significant factor in suicide, but which can also affect the likelihood of people getting or being able to hold down a job. The Central Statistics Office also collects detailed data on the way in which people have taken their own lives. RTÉ has made a decision not to describe those statistics in any great detail. However, suicide charities have made the point in the past that hanging or strangulation is the most common way by which people die. According to the figures, it was the cause of four out of five deaths by suicide in 2013, although women are slightly less likely (68%) to take their own lives in this way, the data showed. The only other category of death, which involves numbers of any significance are deaths by drowning while suicides involving firearms are extremely rare. You can view the full series of maps and charts on suicide and Ireland by clicking here. If you are affected by any of the issues raised in this online report, you can contact; The Samaritans (phone 116123), Console (1800247247) or Pieta House.